BandBites, Volume II, No. 2, December 29, 2008. Copyright © 2008 by Carol Caffin. All Rights Reserved. There's no getting around the fact that The Band were -- and are -- one of the most enigmatic groups in music history. That enigma which, like an aura, enveloped them and emanated from them individually and collectively, was not feigned -- though, truth be told, it was augmented just a bit by the astute myth-making acumen of Albert Grossman and his posse. The enigma, like The Band's legend, has grown exponentially over the years. We're all familiar with Dylan and the Hawks' 66 tour, Big Pink, the Basement Tapes, the iconic Landy photos, Tour '74, The Last Waltz; those projects and eras have been well documented. But every musical group has creative peaks and valleys, and The Band were no different -- except, perhaps, that their highs were a little higher and their lows a tad lower. There are some "lost eras" and some relatively quiet times within The Band's history -- times when they were less active and prolific than others -- and one of those is the Stage Fright era. The Band had released two albums -- Music From Big Pink and The Band ("The Brown Album") -- which, though separate releases, were in many ways a two-part magnum opus. The Band did not have a sophomore jinx to contend with, because "The Brown Album," while a separate entity, was viewed by many as the musical right cross in a sublime and magnificent one-two punch. For The Band, the sophomore doldrums -- the pressure to live up to a knock-out debut -- came with the third album, not the second. By that time, The Band were firmly ensconced in the music scene, revered by other musicians, admittedly great, but hip -- maybe just a bit too hip -- for commercial superstardom. The double-edged sword was that The Band were never an "act." They were artists -- when the term "artist" still meant something. They were neither terribly prolific nor exceptionally active as a touring band and, by 1970, they were still "under the radar" to the mainstream record-buying public. 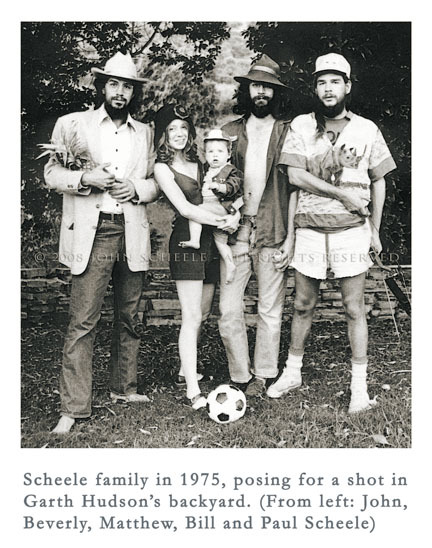 It was during this era that Bill Scheele and his younger brother, John, both longtime friends of Jonathan Taplin, came into The Band's lives and careers, working day-to-day with the guys -- with intermittent breaks -- through the mid '70s. Currently, 60-year-old Bill, who owns an art gallery and lives in Cleveland, and John, 57, a visual effects supervisor for films who lives in LA, are working on a photographic retrospective of their time with The Band. "It includes unpublished images from 1969 through 1976 that fill in some gaps in their history," says John. "There's a lot of good material -- especially from Tour '74." Bill and John are aiming for a Summer 2009 publication date, and I will keep you posted of their progress. In the meantime, here's part of a recent conversation I had with Bill and John about their years with The Band. This interview is dedicated to the World's Cutest Senior Citizen on what would have been his 65th birthday. CC: Sometimes I prep for an interview but, occasionally, I don't do any research or background reading, because I want to be totally fresh and not swayed by what's been written previously. This is one of those instances, so why don't we start with the basics? Tell me about how this all got started. BS:	Well, I'm the oldest in my family, so I'll go first. I'm 60 years old, and I joined The Band when I was 20. That happened because of Jon Taplin -- and this becomes the "Look Out Cleveland" connection because both Jon and I are from Cleveland originally. Jon went off to school on the East Coast -- he developed a special relationship with Albert Grossman, working for Kweskin and other people. And so that was a connection, too, because of our interests overall in what was happening in the music world at that time -- and we all, of course, admired Bob and what he was doing -- his enormous ability as a writer and musician. Bob was backed by The Band in 1965 and 1966 -- they were making amazing, loud music -- but not everyone appreciated it back then. It was another time... so many things were so much different then than they are now. Because I was Jon Taplin's friend and we were both interested in music... he gave me the chance to join The Band and be flown out and meet them when they were still at Sammy Davis's studio. CC:	Wow. So that was what, in '69, right? BS:	Yeah, that was in April of '69. CC:	You know, too, I think that people who were kind of born into the '60s, the younger Baby Boomers, for instance, may not realize that the music business was still kind of young then. You guys were still making the rules at that point, so being a road manager then was a lot different than being a road manager today. I mean now, you can go to the School for the Arts or something and learn how to be a manager or an agent. But there was no formula then. BS:	Absolutely. There was no prep work, no preparation. Our family is more involved in the visual arts than music -- none of us are musicians. But it was an explosive time back then -- there was all kinds of exploration. I don't see the same thing happening now. It was also such a different business. It's the exponential explosion of numbers of people on every single level of everything that's become... there's just "too much of nothing", as Bob put it. There's so much more, but there's so much less. CC:	It's very diluted is what it is. BS:	Yeah. I mean, it was so special. Bob was already a mythological figure -- and we all knew that The Band was associated with him -- but nobody really knew who these guys were, when Big Pink was released in '68. But Jon alerted me that these guys were going out on their own, and asked if I'd be interested. And, I mean, what's your answer gonna be to that? "No?" [Laughs] My answer was "Yes" on a second's notice. It was exciting stuff. CC:	Did you sense that this was gonna be something "for the ages?" Or did you think that maybe they were just a band that might become famous? BS:	It couldn't have been anything but great, because of what they had already done with Bob. Not knowing them yet, it was just a given that it was gonna be worthwhile. I mean, I was going to art school and working at the time, and when Jon called me, it was just "Okay, put everything down and take the flight to LA." Had I not gone, I would have regretted it forever because it was incredible right from the start. JS:	Albert Grossman had set up a kind of personal management style -- he'd handled Bob Dylan's overall career in a very complete manner. I remember seeing Don't Look Back in Cleveland Heights; that Pennebaker documentary gave us both a lot of insight, even though it was from 1965. Dylan had gone quiet for a while and created this aura of mystery, of "what's he doing?" Tapes from what would become The Basement Tapes were being distributed among friends; it was before there'd ever been such a thing as a "bootleg." When The Band's first albums came out, it was such a lucky coincidence that we knew the Taplins -- Jon's brother Bob was my classmate at school -- so there was an opportunity to get involved right away, just as they started to go out on their own. I was just finishing high school at that time and had the chance to drive up for the Toronto Pop Festival to take some pictures. I wasn't there at Winterland for the first shows that Bill was involved in. CC:	So how did it happen that you got involved in The Band's shows? What did you do with them? Did you have an "official" job? JS: I worked over summers, whenever Bill needed another hand. Our brother Paul worked on some of the early shows too. All three of us were there in 1969 for the Toronto Pop and the Woodstock Festivals. Then I covered for Bill on the Festival Express the next summer, in 1970. In the meantime, I was finishing college and went on to CalArts in the Summer of 1974. Bill threw all my stuff on Bob Dylan's cargo plane, flying out from Boston to Los Angeles -- that's how I got moved to California! CC: Now that's a story to tell the grandchildren! How did you start photographing The Band? JS: I was relatively free from the responsibility that Bill had in handling the gigs, so I was able to take pictures a lot of the time. It was already something that I was doing seriously. So we began to have a photographic record of that period -- that complements the terrific photography that Elliott Landy did earlier. Because we were working with them so closely, the photos give a further insight into how The Band worked together. BS:	And it wasn't intrusive, either. CC:	More like that "fly on the wall" kind of feeling. BS:	It was like, "Oh, there's John, Bill's brother, it's okay." They knew us; it was an intimate family feeling. That's what was important to all of us, and that's what made everybody comfortable. It wasn't like the outside weird world that always wanted something from them. CC:	I'm really glad that you brought up the family thing. The word that I often use, and I think it holds true with many people who were in their lives for any length of time, is "synchronicity." I think that with those guys, you could be the most technically proficient or skilled soundman or engineer or photographer or publicist or whatever, but if you didn't click with them personally, it didn't matter. CC:	The whole thing had to do with understanding and intuition. If you were the best PR person in the world, or the most astute manager, it didn't mean anything if you weren't able to "read" a certain subtle look or gesture from one of them and know instinctively what it meant and how to act on it. I think a lot of the people who were good and honest and stuck around with them had that, too, that synchronistic thing. And it seems like you guys definitely did, at a very crucial period. JS:	Yeah, and one of the aspects of Rick that is hard to express, but one of the reasons that he was at the heart of The Band, and part of what made The Band special, is that he had such personal magnetism, a generosity of spirit. He was such a charming and wonderful person -- the "spark plug" of many great musical moments. His kind soul and good spirit came across -- he was like an open book. Over time, you'd see it with different people and circumstances -- Rick's personality was at the essence of those relationships over time. CC:	What was the dynamic in the group -- and what was your role with respect to Jon Taplin? I worked for Jon Taplin -- he was their tour manager -- and dealt with any business affairs. I was the equipment manager; there were only two of us in the beginning, Jon and myself. So I was responsible for all the equipment, the trucking, and set-up on stage. BS:	Well, I flew to LA in '69, when they were still recording [the "Brown Album"], so I began to get to know their instruments and who did what, and basically, it wasn't long. I would say within a week, we packed up and I drove to San Francisco for the first gigs at Winterland. CC:	Sounds like a whirlwind. BS:	Then I began to realize, "Okay, I'm responsible for five different musicians." And everything that they wanted was very specific, you know -- the uniqueness of how they set up on stage was complicated. A lot of bands back in the '60s were a straight line down the front of the stage. But these guys... I mean, they'd been together for at least 10 years by this point, so they knew exactly what they wanted and needed, and with three singers who wanted to harmonize, they had to see each other. And that was another thing I learned. You've got this sound on stage that's rather awesome and, first of all, you can't talk, so I had to learn to look at everybody's eyes, and to find out what might be going wrong, what they needed. CC:	What was their stage set-up like? It was very specific: a semi-circle with Garth in the middle, Richard's piano at stage right, Levon's drums stage left, with Ricky and Robbie in the middle of the arc. So there were good visual lines for Richard, Rick, and Levon -- especially to help them harmonize. Other issues went on for years, like which microphones and stage monitors were the best -- any way to perfect their live performance. CC:	Was there anything innovative in terms of equipment? What did they do that other groups didn't do? BS:	Oh absolutely. I have notes on a lot of the specific gear. First of all, we forever experimented with how to best mic the acoustic piano that Richard played. There were also careful sound-checks. The first few years were so beautiful Carol, because we played fairly small theaters -- old 2500- to 3500-seat theaters, and that were perfect because you can tune halls of that size, and we did. We'd go in around noon for sound checks. Over time, the equipment changed -- I mean, we didn't even have our own PA system in the beginning, but the need for it became obvious. We always were tinkering with things. JS: To add to what Bill's saying, Carol, this arrangement -- the way they set themselves up and passed vocals around, exchanging cues -- it seems obvious in hindsight, but wasn't so. Imagine that same group sitting around the basement at Big Pink, where they could all be looking at each other in a circle. To present that in a stage performance poses different problems. They took it as a serious responsibility to give an audience the same level of expertise and musicianship as in their studio recordings. CC:	It all looked so simple, but it was really very complex below the surface, like a true gourmet meal. A seemingly simple but delicious dish almost always starts with the finest basic ingredients, and the nuances and subtleties are kind of the "secret ingredients" -- just for the chef to know. JS:	Another standout, of course, was Garth Hudson's arrangement of keyboards -- and also the special devices that Robbie worked up for his guitar. There was an intricate nest of wiring and devices that were quite unique. They were each deeply involved in their own equipment -- probably Garth most of all. CC:	Rick would be off stage, in the car, two miles down the road, and Garth hadn't even turned off the keyboard yet. CC:	I always thought there was kind of this dynamic... maybe it wasn't like that when they were younger, but from what I saw, there was a kind of an almost "fatherly" thing between Levon and Rick and like a "hands-off" thing with Garth. Garth could do no wrong. He was in his own place, and they all respected that. They all knew each other's quirks and they respected and protected each other. I distinctly remember Rick talking about "protecting his relationships." He cherished them and I think they felt the same. They gave each other the space they needed, personally and musically. Do you think I'm off on that? BS: No, not at all. And that's why the music was so great. I think that's where other musical groups didn't "get it" in terms of "less is more." There is the classic story of how Eric Clapton wanted to join The Band -- when he came and talked to them and they just said "Why do we need another guitar player?" CC: Okay, tell me. Is that really true? Both Eric and Robbie have talked about it, so I believe that Eric loved them and they were the impetus for him breaking up Cream, but did he actually ask to join The Band? BS: I don't know any more than that, but Eric started working with Delaney and Bonnie around the same time -- maybe he found something similar? The Band were very together from the beginning -- honed by Ronnie Hawkins as a complex unit with two keyboards wailin' all the time -- a spectacular thing. Everybody knew their parts -- it was phenomenal! And one thing I loved, Carol, was to make myself as invisible onstage as possible -- and I especially liked being behind Levon, where I could see everybody else. Levon has an incredible ability as a drummer, I mean he was so amazing -- nobody can touch him. CC:	Mr. Tambourine Man -- he's very underrated, added a lot to Dylan's early stuff. I loved his "twinkly" guitar. BS:	Yeah... and it was truly amazing to me to see all these people come and pay homage. Ralph Gleason wrote after the first Winterland concerts that he saw it was Levon's band, in a sense. But it wasn't really any one person's band; they were all so dynamic! John has captured it many times -- everybody signaling each other. They were together, beating as a whole -- and they worked hard to perfect their stage performance. Some of the early reviews even complained that "the show sounds just like the record." CC:	Well, The Band is one of the few groups that I thought sounded even better live than on record, and their records are amazing. You can't do better than that, because most bands can't come close to duplicating their records. I don't think they were trying to duplicate anything -- they were just great musicians. BS:	That was who they were. CC:	Right. That was who they were. I mean, I've seen them on off nights still be amazing. I'm not talking about anything technical. It's something that comes from the soul. JS:	Their goal was to give the audience a quintessential performance. The music they released on their albums -- they would recreate that sound on stage... .
CC:	I agree. Because they had no problem doing it. They didn't need to be out front to feed their egos, so they made the backing band thing an art form. JS:	Well, yeah. The Band's egos were not a big problem; there was no identity crisis. BS:	And there was no band out there that could follow Bob as well. He's a very quirky musician. The Band was so attuned to him that they could pick up on his changes. Bob would decide to change the tempo in a split second and they could adjust -- nobody else could do that as well. CC:	Rick said that he always watched his hands. JS:	With Dylan, you can see all kinds of cues. JS:	Dylan passes a lot of signals and he has a terrifically well-integrated band now. CC:	They're great. I'd say they're the second best he's ever had. But back to The Band. There are a few "lost eras" in The Band's career. By now, everybody knows a bit about The Basement Tapes sessions, Big Pink, and The Brown Album. They also know a little, but not much, about Stage Fright. 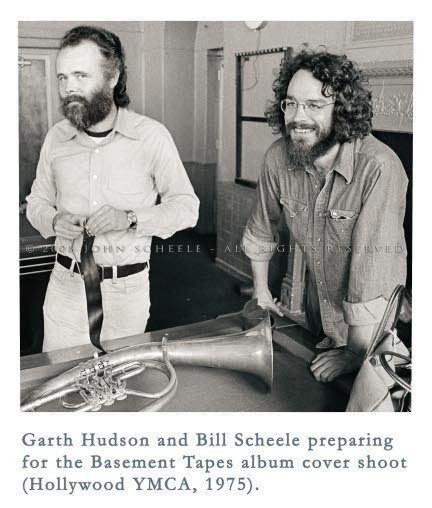 But what about the commercial release of The Basement Tapes in '75? And the photo shoot itself. You were there, right, John? JS:	Yeah, the shot of Bill and Garth was from that day that the Basement Tapes cover shoot was being done -- it was a Reid Miles shoot. CC:	Right. And Bob Cato? He was involved in the cover, right? JS:	Yeah, Bob Cato was the overall designer for the album. BS:	He was the art director. CC:	Is that where it was? Can you tell me about it? CC:	Wasn't David Blue in the shoot? CC: What was the shoot like? JS:	Everyone was having a great time preparing for it -- getting dressed, trying on costumes. JS:	Yeah, I took a few shots of everyone getting ready for the shoot. The photos naturally help me remember what was going on. You probably have experienced this -- that the act of taking a photograph creates a special memory in itself. CC:	You had a cool behind-the-scenes perspective. CC:	Did those guys pick their own stuff? JS:	They all tried stuff on upstairs. When we went downstairs, I didn't take a lot of pictures or intrude into the session, because it was Reid's photo shoot. I only took a few snapshots of them getting ready, kind of documentary shooting. A few pictures show Bob posing people, moving them around in the shot. Reid had roughed out the basic composition, but Bob helped everyone strike their poses, adding to the surrealism. CC:	I can't picture him doing that. CC:	And they are in the moment, I'm sure. CC:	Well I have to tell you, I love Elliott and I love his photos, and he's a good friend. But I think that you captured Rick's essence in the photo you took of him outside the Woodstock Playhouse. It just captures every different facet, all in one shot. It's the same Rick I knew, even though it was many years earlier. JS:	I feel the same way -- for sure, you're on target. This photo sings out to me as a joyful and great expression of who Rick was. I think it answers, in one picture, a lot of the questions about what his personality was like- the nature of his being. There was just this kind of joy in him. CC:	Well, if a picture is worth a thousand words, that one's worth ten thousand. Do you remember the moment, what was happening? He looks like someone just told a joke -- or maybe he was laughing at one of his own. JS:	Todd Rundgren had brought a dirt bike out that he was racing around and clowning with, and Rick was laughing. Todd was like a little kid, spinning around, kind of showing off. Rick was just loving it and cracking up at the sight of Todd racing back and forth with his long hair on this little bike. It was a sunny moment. CC:	A carefree, sweet moment in time. JS:	It was during a break in the middle of the Woodstock Playhouse sessions for Stage Fright. Robbie was coming up with new songs and music, and they were trying to dig deep and pull something together. They were camped out there for quite a while and, in between sessions, right out there on the big lawn leading down to the road -- it was like they were emerging from the a cave, you know, out of the darkness into that brilliant sunshine. The guys would toss a football around, or talk and literally play on the lawn. CC:	You were lucky to be there to capture it. JS:	That was part of the benefit of working with them. My presence was accepted, and I wasn't being obtrusive. CC:	The picture of Rick and Todd Rundgren playing chess. Tell me about that one. 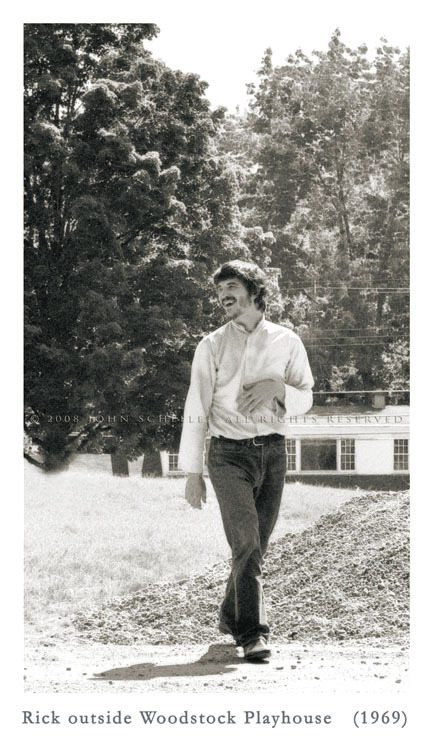 I love it because it shows another very real side of Rick -- a pensive, focused side -- that lots of people don't know, and it is not your quintessential Rick Danko picture. CC:	So the recording sessions, obviously, were not like they had a studio booked and a set amount of time to work on a track or something. What was the structure like, if there was one? JS: They'd set up a situation there to record and write, like they had before. There was better equipment brought in for the recording, but the clock wasn't running as strictly as it would have been if it were in a proper New York studio. It was possible for them to take a little time to come up with new songs and record them. CC:	So I imagine they took breaks and didn't all work on things at the same time. JS:	There was a lot of waiting time, while maybe Robbie and Richard were working on something together. Then Levon and Rick might be tossing the ball or something. CC:	Do you remember anything about any of the songs, or the actual recording during the Stage Fright sessions? JS: "Daniel and The Sacred Harp" stands out in my memory from that session. There's a shot of Levon at the bass drum with Richard and Robbie, starting to get the lyrics for that song down. "Sleeping" conveys a lot of the feeling inside the Playhouse. Maybe it was even written there? Rick was full of great energy; you can see it in that photograph outside. BS: We set up the Woodstock Playhouse stage with The Band's equipment and instruments, creating a twist on the idea of a performance theater. This was a private "recording studio" of sorts, like they had at Sammy Davis' pool house in LA. It was a relaxed atmosphere with lots of room for movement, but it felt strange to have that "empty house" effect. The original plan was to hold a concert after the recordings were complete, but that never happened. CC:	Did you get the sense that they were all each other's best friends? Was it an insular thing, or did they all go their separate ways when the recordings and the shows were over? BS:	It was a combination of those things, Carol. When I joined them, they had already been together for 10 years. Everybody had girlfriends or wives. There was a respect for people's privacy, too. My impression was that they were best friends, but it was also like "Okay, see ya in a while" or "See ya tomorrow". That was the nice thing about living in that lovely little town of Woodstock at first. Nobody was that far away; everybody knew where everybody was. Jon Taplin and I shared a house together that Ricky, Levon, and Garth had shared before. It all went back to that family thing. "Yes, we're all friends, we're the best of friends, but I need some space right now... "
JS:	You're right. A few years earlier, everybody was sharing houses and making music together. You go forward a few years, and now everyone's more into their own thing -- and raising their families. It's kind of like your old best friends versus your family life. BS:	It was also part of my job too... that Jon Taplin and I were hired as full-time people, not just "roadies". I'd go around a lot to see who needed what. At times it was as mundane as who needed their grass mowed or their babies tended to, something like that, just to help out with the life's little circumstances. CC: Bill, while I'm thinking of it: you'd mentioned the guys singing with Cher. Can you tell me how it came about and what they sang? I'm having trouble with the visual -- maybe you can help me. CC: Now you're being a tease! Pictures? Though I'd rather try to block out the mental image than a real one. John, did the guys ever see any of your photos? JS:	Some of my pictures were included in the Musical History boxed set, there was a list of pictures that had turned up in the Capitol archives and from Robbie's collection, I heard, and they were listed as by "photographer unknown." My name wasn't written on them and I'd never publishing them in the past. So I was the "Unknown Photographer". [laughs] I remember hearing from the editor at Capitol that Robbie had said something to the effect, "There weren't that many people in the room; who took these pictures?" Maud Hudson introduced us initially on that project -- they were looking for some specific shots of Garth for the collection. JS:	People were taking pictures all the time, so it wasn't a big problem most of the time. On Rock of Ages, Jon Taplin asked me to help document putting that together, and one of my pictures was used on that album, one of Rick playing the fiddle. Of course, Barry Feinstein was very much the official photographer for Tour '74. CC:	I think they all have their place. There are the iconic photos, the "official" photos, and the candids. And they're all important in different ways. JS:	The photos I took -- and Bill also got a number of great shots -- add another dimension to the work of Elliott, Barry, and other photographers who shot The Band. CC:	Can you tell me a little about Festival Express, or as Rick called it, "Orient Express?" 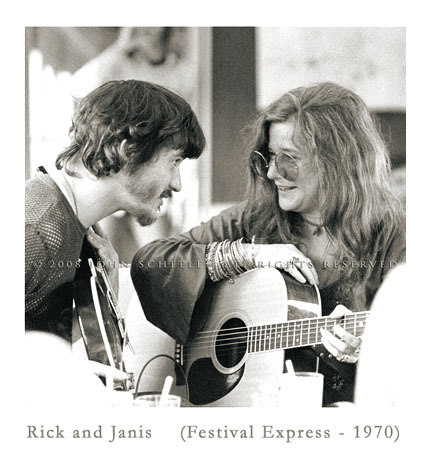 I mean, The Band performed, but the entire Band was not on the train, and I think there was some bonding between Rick and Eric Andersen, Rick and Janis -- and I also think that train experience was one of the first, if not the first, times that Rick was really on his own as a musician. JS:	That was a period when Bill wasn't there. He turned over the keys to me for a while to cover things while he covered things on the home front. So I had a chance to catch that train with Jon Taplin and Rick. He was in wonderful form, and it was him on his own as Rick Danko, not only as a representative of The Band. There was a natural flow and camaraderie -- Rick was shining! He was among other great peers, like Janis, Eric, Jerry Garcia, Ian and Sylvia Tyson- all hanging together, playing and talking. They weren't sitting on the train thinking "Wonder how we can roll this into our next record deal" or something like that. CC:	Well, of course every working musician needs and wants to make a living, but I agree with you completely. And I know that, if he had been born 200 years earlier, Rick would have been a wandering troubadour. He was happy just to play. JS:	Yes, which goes to something that's been said about Rick having an "arrogant personality" or something... that was absolutely not Rick! CC:	I know. That "arrogance" thing was such a ridiculous assertion, and anyone who knows him knows that. But I try to keep what Rick said in mind, to focus on the positive, which seemed to work well for him! 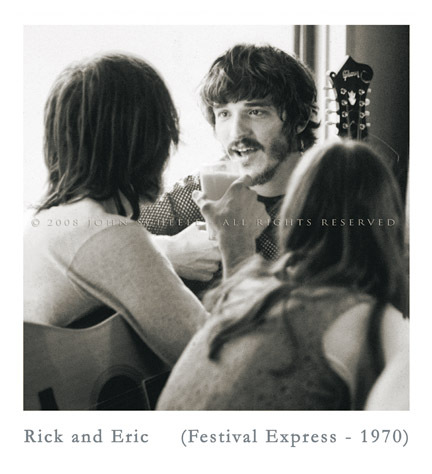 Do you remember the relationship between Rick and Eric at Festival Express? JS: They seemed like brothers reunited, and had a great time making music with everyone. It was like a suspended moment in time. I read later that Janis had gone up and asked the conductor to slow down the train. Everyone savored the moment. There was also an informal session in Robbie's hotel room after the last show in Calgary -- nobody seemed to want it to end. He and Rick played new songs from Stage Fright for Eric, and then Richard joined them after a while and played harp. I remember Rick gave Eric a blues lesson of sorts, showed him some things on guitar. They were very close. CC:	Wow, I wonder if Eric remembers any of that. I'll have to ask him. I feel very fortunate that I got to spend a lot of time with them together. There was definitely a love, but a healthy rivalry there. They kept each other on their toes. I can't imagine them together that young. Do you remember Rick running behind the Festival Express train in American Flag pants? Eric distinctly remembered it, but he had no idea who was driving Rick or why he was late. Rick wearing pants like that -- it has the ring of truth; I can see it clearly. JS: Maybe they were Electric Flag pants? CC: We can only hope. But I don't think so. You said you were with him? JS: My memories are pretty disjointed... Jerry Garcia and Janis Joplin were conducting some kind of informal acid test -- with Southern Comfort as a chaser. I can remember running along the track, and Jon Taplin jumping on board just ahead of me. We were late and the train had already left the station. I think they just slowed down enough for us to get a leg up! It was just the three of us on that stretch. Robbie was still mixing "Stage Fright" in Woodstock -- he and the rest of the group flew on to Calgary for the next show. CC:	When was the last time you saw the guys? JS: I ran into Richard by chance at the Santa Monica Civic -- sat with him to see Bob Dylan play music from his Saved album. That was probably in 1980? There was a show at the House of Blues much later. I've seen Garth and Maud many times over the years, most recently at the Grammy Awards in Los Angeles. Robbie and Arlie Manuel were there, too. BS: I saw The Band several times in the late 80s and early 90s, and started going back to Woodstock in 2004 to reconnect with Garth and Levon. The last time was the spring of 2005, when Levon was just beginning to sing a few songs again -- and Garth sat in at one of the Rambles. I'd seen Rick play in Cleveland at Wilbert's in 1998, I think, backed by Professor Louie. We got to talk for quite awhile after the show. That was the last time.